Kuramathi island resort is a private hideaway, set on Rasdhoo Atoll with wide range of relaxing and adventures activities. Encircled by stunning lagoon, fantastic house reefs and lush vegetation the island offers untouched and unspoiled escapism. With the island 70 Km west of Male international airport you can reach this island through a 20 minute seaplane transfer from Male international airport. A perfect retreat for families and couples, the resort offers 290 villas with 11 room styles designed to meet the needs and specification of each guest. Well-equipped and well-appointed the villas are inspired by traditional Maldivian architecture. Offering endless view of the pure white sand beaches and azure oceans, the villas blends with the nature creating a perfect harmony. Indulge in sheer pleasure of tasting unforgettable culinary delights at Kurumathi island resort. Savor the best of international delights including Maldivian, Sri Lankan, Indian, Indonesian, Japanese, Chinese, Thai, Italian or Continental specialties at 14 Restaurant and bar offered. With relaxing and pleasing atmosphere, the restaurants are interesting way to enjoy Maldives. With range of adventurous and relaxing activities offered indulge in water sports activities, scuba diving, relaxing spa and many more. A perfect place to spend your tropical vacation with loved ones. On your arrival to International Airport - Resort representatives will be stand by to welcome you or at Resort Airport Counter 4 or 5. Kuramathi Spa Nestled at the heart of the island surrounded by lush vegetation of with a perfect backdrop of the turquoise lagoon, Kuramathi Spa caresses you with exceptional treatments. The spa instills a sense of wellness, inner harmony and calmness. In spite of the fact that our Spa has been with us for a long time, Kuramathi Spa now prides itself with its level of perfection in Spa Hospitality and Services provided. The renewed settings exudes prosperity and quietness and new scents fill the air. Every Guest is offered a moment in haven that will impart a feeling of health, adjust inward concordance and reestablish vitality. A place to reconnect with one's self, and permit the common stream of unadulterated vitality, bringing back mindfulness into being. We have incorporated, Ancient Rituals that once fed our Body, loose the Mind and adjusted the Spirit, with the largest level quality of European beauty items and Far-Eastern natural fundamental oils, all in great respect to our environment and location. Rituals are performed by our group of highly trained experts, from Asia, each anxious to make a remarkable ordeal each time you are in their care. 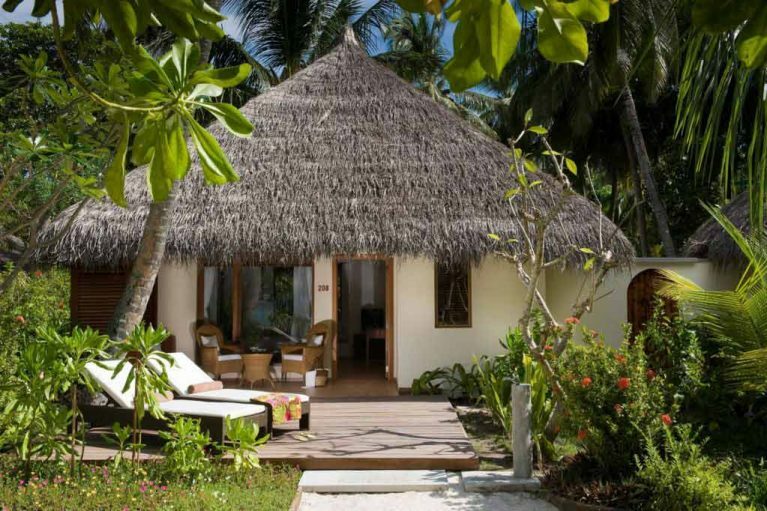 Cloistered in lush foliage of island, beach villa is spacious with beach just few steps away. 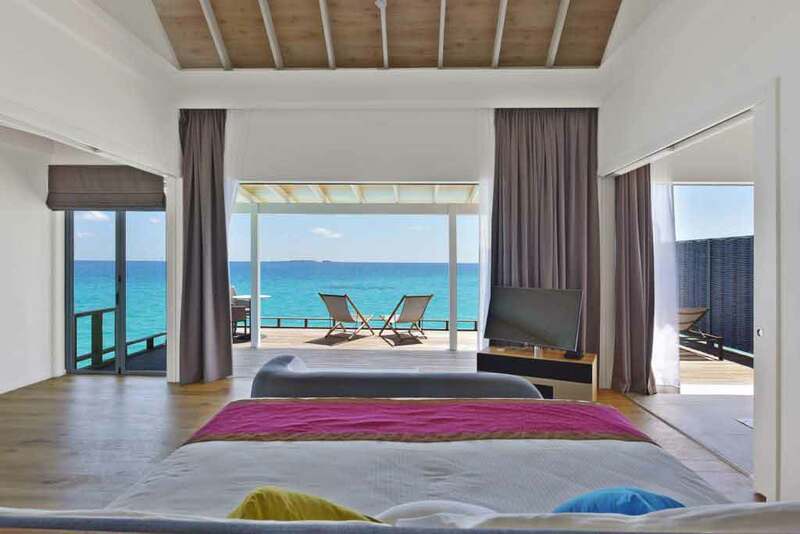 Positioned to capture mesmerizing view of turquoise lagoon, the villa comprises of master bedroom with king size bed, en-suite open air bathroom with outdoor rainfall shower, bathtubs, and extended deck with sun loungers and daybeds leading to beach. 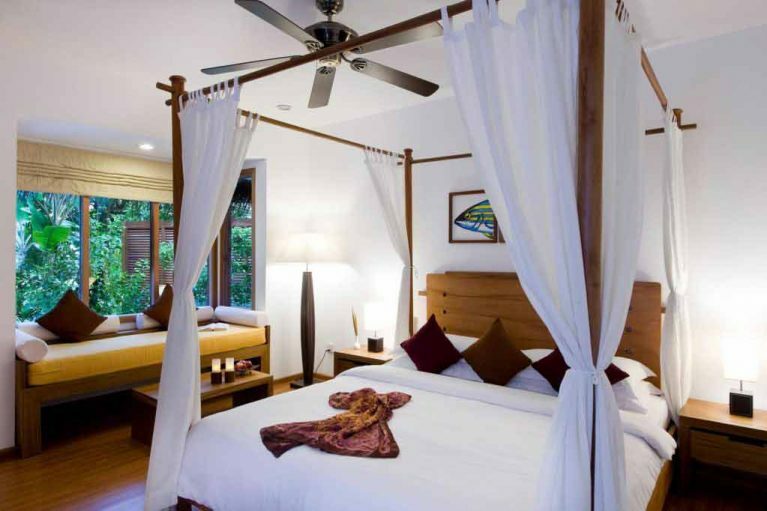 Set in abundant lush vegetation of island, this villa is designed for couples. Kindle romance and intimacy in this hideaway offering complete privacy and intimacy. 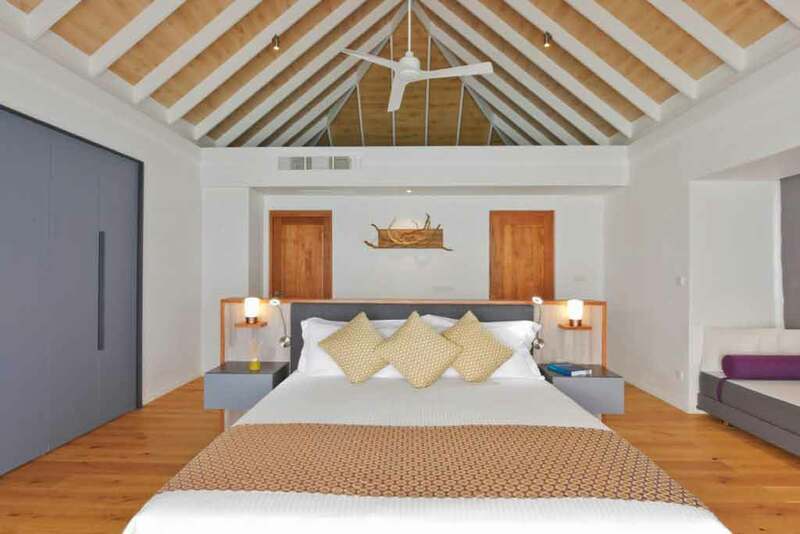 The villa comprises of master bedroom with king size bed, en-suite open air bathroom with outdoor rainfall shower, bathtubs, open air Jacuzzi and extended deck with sun loungers and daybeds leading to beach. Set on natural gardens of the island, superior beach villa with Jacuzzi is a chic contemporary villa offering direct access to the ocean. The round shape villa is spacious and well-appointed offering master bedroom with king size bed as the centerpiece , open air bathroom with bathtubs, indoor and outdoor shower, open-air Jacuzzi, expansive outdoor deck with sun loungers and daybeds leading to beach. Set on the middle of the island on stunning pure white sandy beaches, deluxe beach villa with Jacuzzi is a spacious haven for beach lovers. With inviting warm interiors and chilled atmosphere, relax and enjoy the unspoiled view of lagoon from comforts of spacious villa. The master bedroom features king size poster bed and indoor daybed. The spacious semi-open air bathroom features a bathtubs, twin vanities, indoor and outdoor showers leading to spacious garden area with a rainfall shower, sala bed and Jacuzzi. The extensive outdoor area features sun loungers, sun umbrella and daybed. Perched over the sapphire ocean, deluxe water villa is a spacious and airy villa. On the middle of Sapphire Ocean, enjoy breathtaking view and cool breeze in your private sundeck sipping a drink. The villa comprises of expansive outdoor deck with sun lounger, daybeds, and sun umbrella, dining table leading to turquoise lagoon. Set on plankton with endless view of Azure Ocean, water villa is an ideal choice for couples looking for a private getaway. With house reef accessible by the villa, one can explore the underwater world from their villa. 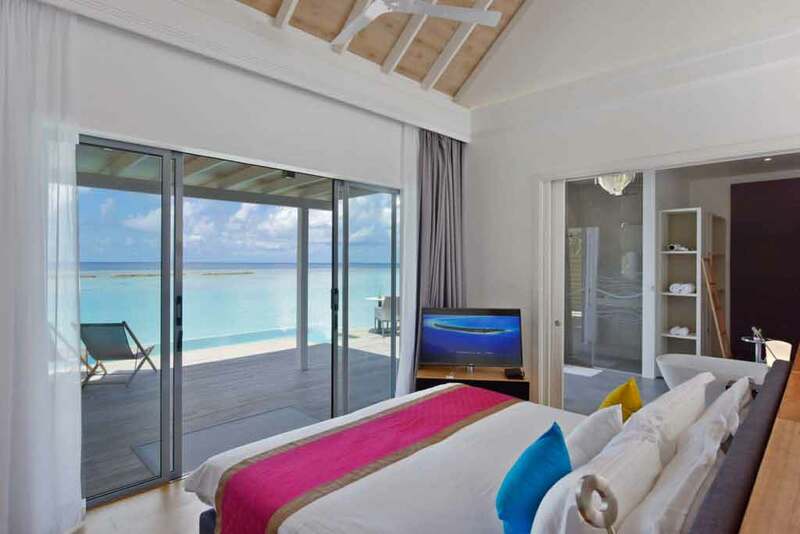 Enjoy the breathtaking view of house reef and Azure Ocean in the water villa comprising of master bedroom features king size poster bed and indoor daybed. The spacious semi-open air bathroom features a bathtubs, twin vanities, indoor and outdoor showers, rainfall shower and Jacuzzi. 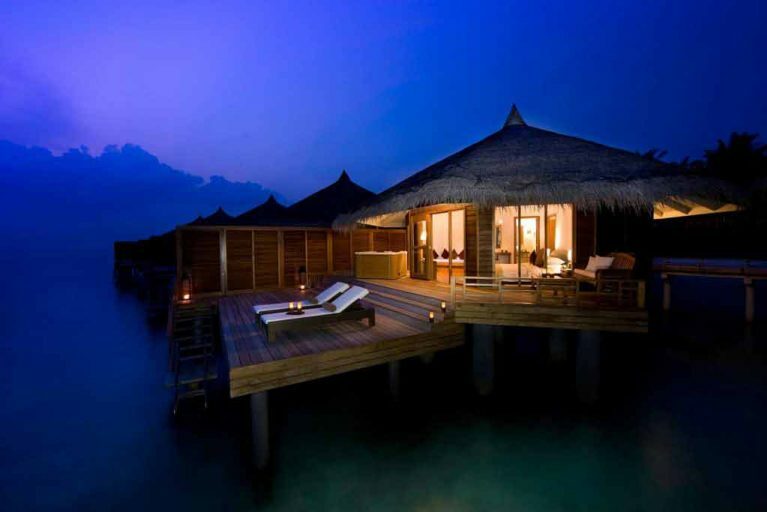 Positioned to capture the view of turquoise lagoon or house reef, the water villa are comfortable and sophisticated. The villa features a spacious infinity pool overlooking the lagoon. The villa comprises of expansive outdoor deck with sun lounger, daybeds, and sun umbrella, dining table leading to turquoise lagoon. 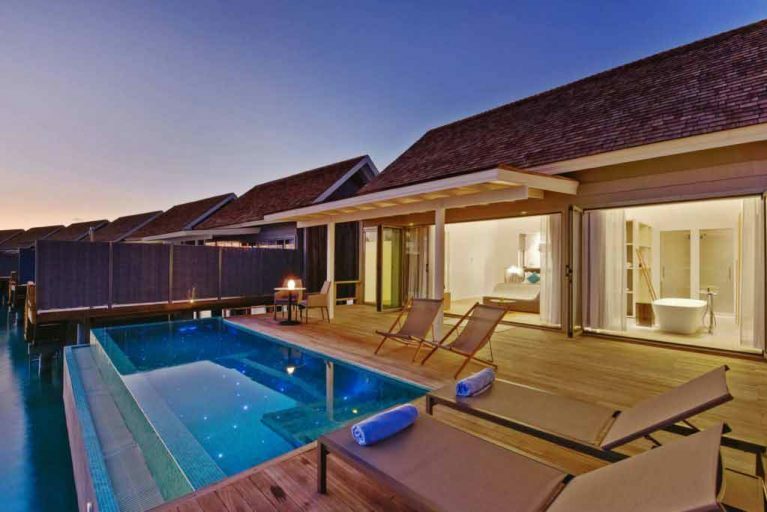 Positioned to capture the romantic sunset, sunset water villa with pool is spacious and comfortable. Master bedroom with king size bed the room are bright and spacious overlooking the turquoise lagoon. The villas comprises en-suite bathroom with shower, standing bath, twin vanity and outdoor shower. With spacious infinity pool, the deck also features sunbeds, sun loungers, dining table. Set at the edge of the chalky beach positioned to capture the mesmerizing sunset, sunset pool villa are edgy and contemporary. Master bedroom with king size bed the room are bright and spacious overlooking the infinity pool. 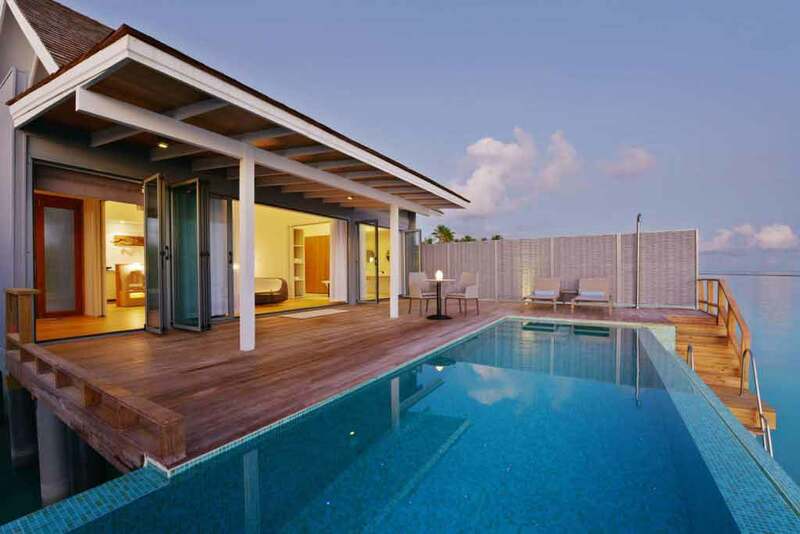 The villas comprises en-suite bathroom with shower, standing bath, twin vanity and outdoor shower, with spacious infinity pool, the deck also features sunbeds, sun loungers & dining table. 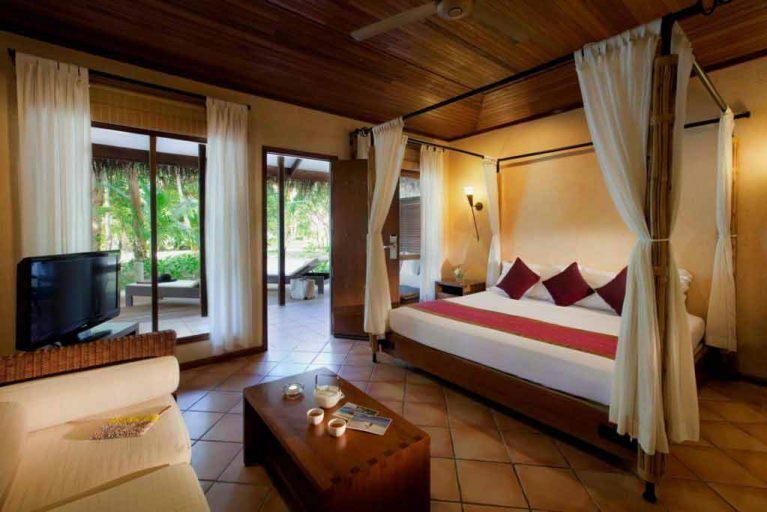 A romantic bliss, honeymoon pool villa is a perfect choice for couples. Kindle romance in the intimate private villa overlooking turquoise lagoon. The villa has a master bedroom with king size bed, living area with sofa and entertainment set, en-suite bathroom with standing bath, bathtub, shower and outdoor deck. The deck features infinity pool, sun lounger, and daybeds overlooking Sapphire Ocean. Nestled within the lush foliage of the island, two bedroom beach house is an ideal choice for families and friends. Spacious and elegant, this double deck villa comprises of 2 bedroom with king size bed and daybeds, elaborate living space with entertainment set and sofas. Expansive bathrooms well-equipped with bathtubs, shower, twin vanity and outdoor rainfall shower. Extensive outdoor area with sun loungers, sun umbrella and daybed leading to beach. Indulge in sheer pleasure of tasting unforgettable culinary delights at Kurumathi island resort. Savor the best of international delights including Maldivian, Sri Lankan, Indian, Indonesian, Japanese, Chinese, Thai, Italian or Continental specialties at 15 Restaurant and bar offered. 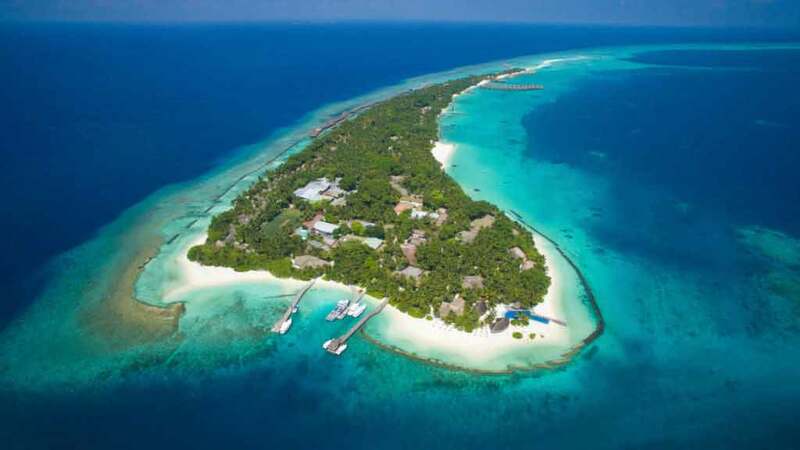 With relaxing and pleasing atmosphere, the restaurants are interesting way to enjoy Maldives. Haruge, Malaafaiy, Farivalhu The eclectic menu restaurant offers international cuisines with relaxing and laid back atmosphere. Located in different part of island, the restaurants offer succulent breakfast, lunch and dinner. Island coffee shop An all-day dining restaurant serving international cuisines, island coffee shop is a pool facing chilled back restaurant. Siam garden Situated in luscious vegetation of island, siam garden is an authentic restaurant serving Thai cuisines. The eclectic restaurant serves variety of seafood, beef, and chicken, fresh sea food. Tandoor Mahal Surrounded by lush foliage of island, tandoor mahal is an open air restaurant serving delicious curries, rice, Biriyani, naan. The reef Perched over turquoise lagoon, the reef is an intimate seafood restaurant. Enjoy fresh seafood with candle lit dinner overlooking the lagoon. Kobe It’s a Teppanyaki over-water restaurant serving delectable cuisines. Enjoy food prepared by culinary chef’s right in front of you at Kobe. Palm Set amidst the swaying palm trees, experience tropical Maldives in this off shore restaurant serving Mediterranean delights. Enjoy pastas, firewood pizza, and homemade ice cream in this tropical retreat. Duniye is an eclectic restaurant serving delectable meal and an array of fine wine. Indulge in fine dining at Duniye. Island Barbecue Set on the white chalky beach overlooking the pool and sea, island barbeque serves fresh meat, fish cooked to perfection at grill station. Private dining experience Kuramathi offers private dining avenues for its guests. 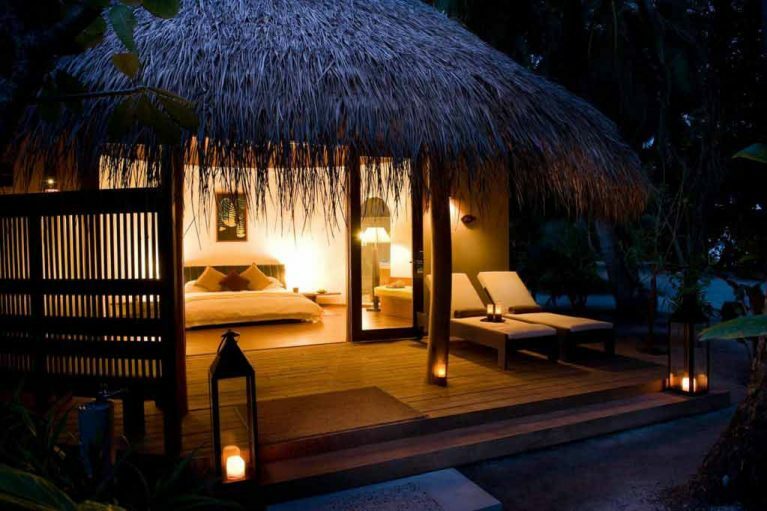 Dine on uninhabited island or on beach or on your private villa, with your loved ones at Kuramathi. Fung bar A palace to relax and unwind, enjoy cool breeze of waves sipping your favorite cocktail at Fung bar. With live DJ, dance to tune of music and party hard. Dhoni bar Enjoy your favorite drink in a private yacht cut through the azure ocean at Dhoni bar. Laguna Bar Situated at the end of island, relax and unwind in this intimate bar. Enjoy signature drinks in the open air restaurant. Sand bar A barefoot bar, enjoy the sand and cool cocktails and mocktails at sand bar. Havana Club Wine & Cigar Bar Offers a diverse determination of wines from around the world, and the finest of international cigars in a cool setting. It is a perfect spot for an aperitif or a late night get together. For the individuals who wish to feel like a star for a night, Karaoke is accessible. Havana Club opens from 18:00hrs until late. Champagne Loft Offers an extensive variety of champagnes, shimmering wines and white spirits – together with incredible views of the Indian Ocean. The Champagne Loft welcomes guests over 16 years. This is to keep up the intimate setting in this bar. Sky Bar Roosted 7 meters above ocean level, Sky Bar is a scene absolutely intended for sheer privacy merged in solace and extravagance. Select from 6 unique packages for a customized evening with your adored, or with a gathering of close mates, while you witness falling stars from a starry Maldivian sky. Choices of over 15 Restaurants & Bars. One of the best recreational diving area in the world.